If you keep chickens and haven’t yet heard about the FDA’s recent rules and standards changes please take a moment to read them. In this post, we’ll provide some small flock guidelines and reminders to help you understand what this means for your pet chickens. New rules set in place for increased food safety and security have changed the accessibility of many medications for your backyard chickens. Previously, you might go to your local farm and feed store to pick up antibiotics, but now, a licensed veterinarian is required to diagnose your chicken/s and prescribe antibiotics for your flock. The changes and rules that make it easier for factory farms, now present challenges to small farms as well as people who keep pet chickens in microflocks. Veterinarians who see poultry are not easy to find in many locations. Many small flock owners are now realizing they may not have a vet service to go to in case of flock illness. So what to do if your flock becomes sick? Before we get to the small flock guidelines, keep in mind your flock may never have a need for a vet visit. And there are lots of great ways to be proactive in keeping your flock healthy. My Pet Chicken provides wonderful information—for free—to help keep a healthy flock going strong. There are also medications available you can get without a licensed vet—be sure to read the directive at the link above. But there are also things you can do to increase biosecurity and improve the healthfulness of your flock’s environment. The first of our small flock guidelines involves providing immune supplements. Do your research, and choose your favorite. 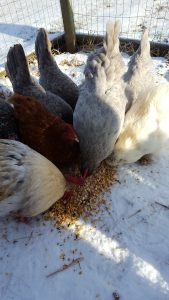 I’m a multipurpose girl myself; I don’t like to bog down my flocks’ diet with so many different supplements. 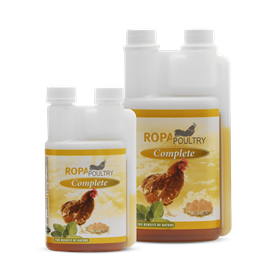 My personal favorite supplement for immune health is the RoPa Poultry Oregano Oil Complete. This product goes into your chickens’ waterer on a daily basis. It builds gut flora health and helps reduce the need for antibiotics, among other things. Simple biosecurity procedures can make a world of difference for you and your flock. We suggest you read our detailed biosecurity guidelines. But generally speaking, you should try to be aware of the risks of cross contamination. Don’t share equipment and don’t take used equipment from other people. It’s best to buy new items and deep clean them as often as possible. And reduce risks as much as possible. Keep wildlife out of your birds’ area, and don’t let your dear friends with chickens wander through your coop/run area. Bacteria, fungal spores, viruses can all hitch a ride on their clothes or shoes. At MPC we practice what we preach: I personally have a pair of shoes I use specifically to wear out with the chickens when we’re feeding and cleaning. I don’t wear the chicken shoes to my friends’ homes. And I use an aviary netting around my chicken fencing to keep out wild birds. Since we do a lot to keep the large predators away, it makes sense to do our best to keep the disease and pathogen carriers out of the coop and run areas as well. It’s a good time to identify the nearest vet that will see chickens—before you need one. Get that phone number on file. If your search for a vet has turned up empty, we suggest reaching out to your local county extension office to ask their advice. They have many good contacts in their system to share with you. They may even have classes, or provide local warnings and advisories as to agricultural concerns in your area. You can also consider reaching out to any agricultural or veterinary school in your area to see if they have resources available. Of course it doesn’t hurt to have a good reference book or two for your library. The My Pet Chicken Handbook is great to have on hand because in addition to care, tips, recipes and so on, it has a section explaining how to make the determination if something you’re seeing warrants a vet visit. For information about symptoms and overviews of specific illnesses, you can visit the Health category of the Help Topics section of our website. The Chicken Health Handbook is also a valuable reference on this subject. My Pet Chicken wishes you and your flock the best health possible and a happy 2017!